Here you have it! 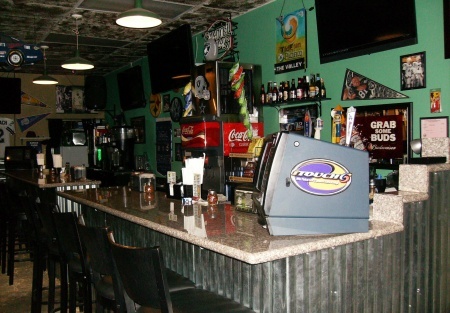 A New York Style Pizza Business with Great Reviews as well as other great foods served, a beautiful Granite Bar with 12 Exciting Tap Beers, and Live Music on the Weekends. This is a good all around place to go to find good food and meet great friends in an upper class area of northern Los Angeles county. Located in the Santa Clarita Valley on a heavily traveled street, you have the opportunity to capture these potential guests. This corner location on a busy intersection is surrounded by student learning centers as well as other professional businesses, bringing in families and other customers and clients looking for a Good place to eat. So you'll get a good lunch crowd as well as dinner crowd. Whether its a great Pizza to enjoy with the family or to sit and enjoy a Cool Beer with your Friends as you watch a game on one of there 5 large screen TV's. Or come by and play some darts, listen to the live band and just Chill. This is the place. Owner has spared no expense in building this place out, making it a very nice looking place as well as extremely functional. You cash in on all he has put in place and just build the business from there. Owners Stated income is $6K per month. Buyer to use due dilegence to verify present stated earnings and Broker makes NO representations otherwise and will not be responsible for Buyer;'s failure to checkout the number. Owner looking to move from area and has priced this business for a fast sale. SO DON'T Delay in checking this out. Most restaurants in this area don't stay on the market very long as it is a very desirable area. To get Name, Pictures and Address so you can check out this Restaurant/Sports Bar on your own time, just go to the "Sign NDA" at Selling Restaurants dot com and that's what you'll get!